US, 2004, 85 minutes. Colour. Christopher Walken, Josh Lucas, Michael Caine, Jonah Bobo, Glenne Headly. While ‘around the bend’ might mean in English that you are a bit mad, this title comes from a song by Creedence Clearwater Revival which refers to something ‘up around the bend’. That is the cue for a road movie and that is what this film is – but with quite a difference. We are introduced to three generations of the Lair family. The patriarch is former archeologist, Harry, Michael Caine (with his too noticeably odd American accent) who has taken care of his rather normal, even straightlaced banker grandson, Jason, Josh Lucas, who has custody of his six year old son, Zack. Harry is a wily old coot who likes to dine out at KFC restaurants. When his long-absent son Turner, Christopher Walken, suddenly turns up, he is finally ready to die. But, not before arranging his cremation and complicated rituals for the scattering of his ashes. This is to be a pilgrimage for son, grandson and great-grandson, travelling from California to New Mexico, opening successive clues stuffed into takeaway bags over a KFC meal. The journey leads them through their own emotional desert as well as some rocky ground to understanding, love and forgiveness. It is a fine film on family reconciliation. Michael Caine makes quite an imprint on the film in a small but significant role which sets the tone of the film. 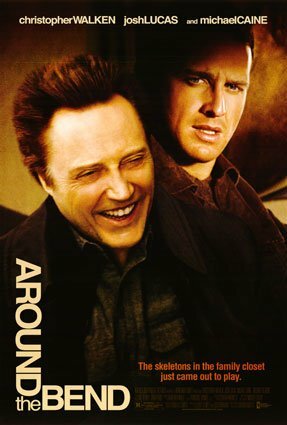 Christopher Walken gives another complex and intense performance that indicates great weaknesses in Turner’s character but also the potential for coming to terms with his mistakes and his life. Josh Lucas is sympathetic as the son who has reason to resent his absent father and who is the carer for his son, played by the talented Jonah Bobo. If the film had not been made in the US, reviewers would have referred to it as being ‘quirky’, as having ‘quirky humour’. It has. It also has great pathos and is well worth catching, talking about and reflecting on. 1. Title and expectations? Up around the bend? A journey and a goal? 2. A family story, the four generations? Happiness and unhappiness? Reconciliation and resolution? 3. The film as a road movie, home, the landscapes, Los Angeles, Arizona, New Mexico? Urban and desert? The final rocks? The musical score? 4. Kentucky Fried Chicken – product placement and key plot element? 5. The introduction to Harry and his family, the generations, the missing son? 6. Harry as patriarchal, Michael Caine and his presence, style (and accent)? Benign, memories of his wife, his work as an American archaeologist? His absent son? Jason and bringing him up? With Zach? Their life, way of talking, blunt, chat, ribald? Jason as quiet? The nurse? From Scandinavia? The tensions in the house, especially with Jason? His limp? The background of his mother’s death? His own separation and divorce? 7. Turner’s arrival, sudden, after thirty years, his reputation as a thief, Harry happy to see him, Jason and his tensions, Zach and his delight with his grandad? 8. The KFC meal, the tensions, vegetarians, Jason not liking chicken, the nurse and her presence, joining them? 9. Harry and Zach going to KFC, writing the post-its, the letters, the map, the cremation instructions, the bag with all the information? The journey? 10. The call, Jason and Turner and their arrival, Harry dead? Zach and his promising not to tell where the destination was? Albuquerque? 11. The will, the lawyer, the puzzles? 12. The conditions, the cremation, Jason’s objections? Turner and his plan to leave, not leaving? The KFC stops, the ashes, the ashes of the dog (and Harry’s prediction that the dog would die)? The map? 13. Zach, his delight, sharing the journey? Turner and his dance? The camping out? The bond with his father? With his grandfather? 14. Turner and his decision to go on the trip for Harry’s sake, driving, sleep, arguing, the motel and Jason ousting him, the KFC being shut and the demands, finding the ruined KFC? Finally getting to Albuquerque? 15. Jason, his tight manner, proper, his work at the bank, his mobile phone – and Turner throwing it away? His learning from his father, learning with his son, the camping out, the dancing, the laughter, his being persuaded to honour Harry? 16. Albuquerque, Turner leaving, Jason finding him at the house, the steps and the instructions in the letters, Harry’s motive? Turner thinking it was spite? The note for Jason to forgive? Turner telling the truth, the story, throwing his son down in grief at his wife’s death? 17. Forgiveness, Jason’s magnanimity, touching his father? 18. The meetings with his wife, the truth, Turner escaping from prison, terminal illness? Turner’s telling Jason about the rock where he was conceived? Jason and Zach driving, the finale on the rock? 19. Themes of death, rituals, families, peace, truth and reconciliation?